Perisynaptic glial cells respond to neural activity by increasing cytosolic calcium, but the significance of this pathway is unclear. Terminal/perisynaptic Schwann cells (TPSCs) are a perisynaptic glial cell at the neuromuscular junction that respond to nerve-derived substances such as acetylcholine and purines. Here, we provide genetic evidence that activity-induced calcium accumulation in neonatal TPSCs is mediated exclusively by one subtype of metabotropic purinergic receptor. In P2ry1 mutant mice lacking these responses, postsynaptic, rather than presynaptic, function was altered in response to nerve stimulation. This impairment was correlated with a greater susceptibility to activity-induced muscle fatigue. Interestingly, fatigue in P2ry1 mutants was more greatly exacerbated by exposure to high potassium than in control mice. High potassium itself increased cytosolic levels of calcium in TPSCs, a response which was also reduced P2ry1 mutants. 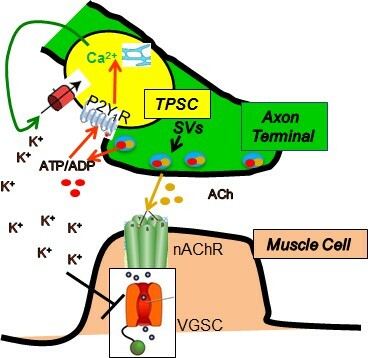 These results suggest that activity-induced calcium responses in TPSCs regulate postsynaptic function and muscle fatigue by regulating perisynaptic potassium. A muscle that contracts over and over again will become tired. This can sometimes occur after vigorous exercise, but abnormal muscle fatigue is also a feature of various clinical disorders. These include conditions that affect muscles directly, such as muscular dystrophy, as well as disorders of the motor nerves that control muscles, such as Guillain-Barré syndrome. Nerves make contact with muscles at specialized sites called neuromuscular junctions. Failing to send the correct signals to the muscles at these junctions can lead to muscle fatigue. Studies to date have focused on the role of nerve cells and muscle cells in these communication failures. But there is also a third cell type present at the neuromuscular junction, known as the terminal/perisynaptic Schwann cell (TPSC). Stimulating motor nerves in a way that produces muscle fatigue also activates TPSCs. To investigate whether TPSCs contribute to or counteract muscle fatigue, Heredia et al. studied the responses of these cells at the neuromuscular junctions of young mice. Stimulating motor nerves caused TPSCs to release calcium ions from their internal calcium stores. However, this did not occur in mice that lacked a protein called the P2Y1 receptor. In normal mice, activating the P2Y1 receptor directly also made the TPSCs release calcium. This calcium release in turn prompted the TPSCs to take up potassium ions. Nerve and muscle cells release potassium during intense activity, and removal of potassium by TPSCs helped to prevent muscle fatigue. Therapeutic strategies that make TPSCs release more of their internal calcium stores – and thus increase their potassium uptake – could help ease muscle fatigue. A valuable first step would be to use drugs and genetic techniques to show this effect in mice. The results could then guide the development of corresponding strategies in patients. Muscle fatigue is defined as the decline in muscle performance that occurs in response to continued muscle activation. Muscle fatigue is a clinically important feature of myopathies such as muscular dystrophy, neuromuscular disorders such as Guillain-Barré syndrome, diseases of the central nervous system (CNS) such as multiple sclerosis, or diffuse conditions such as chronic fatigue syndrome and cachexia (Katirji, 2002). A wide variety of mechanisms in the central and peripheral nervous systems contribute to muscle fatigue. In simplified preparations of muscle and peripheral nerve, central sources of input are eliminated, permitting the examination of peripheral sites of fatigue, such as the presynaptic release of the neurotransmitter acetylcholine (ACh) at the neuromuscular junction (NMJ; Nanou et al., 2016), sensitivity of postsynaptic ACh receptors, propagation of the muscle action potential along the sarcolemma and into the t-tubules, release of calcium (Ca2+) from sarcoplasmic reticulum, and activation of the contractile apparatus (Boyas and Guével, 2011). Proposed mediators of fatigue at these sites include changes in the concentration of intracellular and extracellular ions, such as calcium (Ca2+), sodium (Na+), potassium (K+), or protons (H+); metabolites, such as inorganic phosphate (Pi), or lactate; and reactive oxygen species (Allen et al., 2008). For example, high-frequency stimulation (HFS) of nerve or muscle raises the level of extracellular K+ or [K+]o, which may mediate fatigue by depolarizing muscle membrane, inactivating Nav1.4 voltage-gated sodium channels at the NMJ, and consequently blocking the production of muscle action potentials (APs; Cairns et al., 2015) This mechanism may also underlie the muscle weakness observed in patients with hyperkalemic periodic paralysis, a neuromuscular disorder caused by dominant mutations in the Scna4 gene encoding the Nav1.4 channel and characterized by episodic muscle stiffness and weakness (Cannon, 2015). In addition to presynaptic nerve terminals and muscle endplates, terminal or perisynaptic Schwann cells (TPSCs) reside at the NMJ. TPSCs are a non-myelinating Schwann cell subtype that influence the regeneration of injured peripheral motor axons (Son et al., 1996), maintain developing synapses (Reddy et al., 2003), and participate in synaptic pruning (Smith et al., 2013). TPSCs also respond to neural activity by increasing cytosolic Ca2+ levels (Jahromi et al., 1992; Reist and Smith, 1992) and are therefore functionally similar to other perisynaptic glial cells, such as astrocytes and enteric glia. In addition to responding to neurotransmitter released during neural activity by mobilizing Ca2+, astrocytes regulate the concentration of extracellular metabolites produced by activity through the expression of various ion channels and transporters (Olsen et al., 2015; Boscia et al., 2016; Weller et al., 2016). Therefore, TPSCs, as the perisynaptic glia of the NMJ, likely act to modulate the concentrations of these ions at the NMJ and thereby regulate muscle fatigue. In astrocytes, activity-induced Ca2+ signaling is largely mediated by neurotransmitter-mediated stimulation of Gq G-protein coupled receptors (GPCRs), leading to the release of Ca2+ from the endoplasmic reticulum (ER) through the second messenger inositol-1,4,5-triphosphate (IP3; Volterra et al., 2014). Astrocytic Ca2+ signaling in turn modulates synaptic transmission and contributes to functional hyperemia, although each of these effects remains controversial (Agulhon et al., 2010; Bonder and McCarthy, 2014). The interpretation of these effects is complicated by the observation that the mechanisms contributing to activity-induced Ca2+ signaling in the fine processes of astrocytes are distinct from those underlying this signal in the cell body (Bazargani and Attwell, 2016). Additionally, the diversity of astrocyte subtypes in the brain (Eugenín León et al., 2016) and of neuronal subtypes associated with individual astrocytes (Perea and Araque, 2005) further challenge the precise identification of activity-induced Ca2+ responses in these cells. Finally, the extent to which IP3R-mediated Ca2+ signaling reflects all of the effects of activity-induced Gq GPCR activation remain unclear (Agulhon et al., 2013). TPSCs, by contrast, are only associated with the nerve terminals of cholinergic motor neurons (MNs). The NMJ is large and amenable to optical analysis owing to its discrete location at the central endplate band region of muscle. TPSCs do not elaborate extensive processes or make specialized contacts with the microcirculation. Together, these features make the TPSC suitable for the genetic manipulation of their response to and regulation of neural activity. However, the examination of activity-induced Ca2+ responses in TPSCs and the functional effects of these responses have been largely conducted by imaging individual TPSCs injected with fluorescent Ca2+-binding dyes (Darabid et al., 2014). Thus, whether the effects of single TPSC manipulation on individual synapses lead to global effects on neuromuscular function cannot be examined. 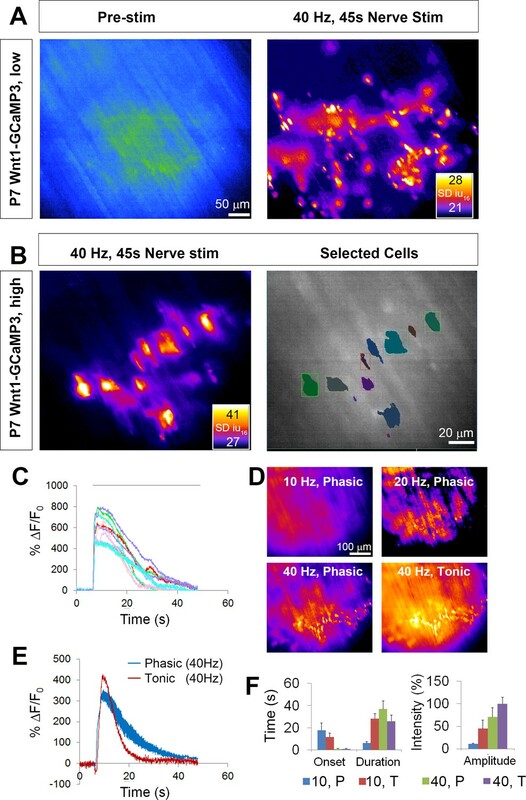 Using mice that express the genetically-encoded calcium indicator GCaMP3 in all Schwann cells including TPSCs, we observed that high-frequency, motor nerve stimulation-induced Ca2+ signaling within TPSCs of the neonatal diaphragm was completely abolished in the absence of the purinergic 2Y1 receptor (P2Y1R). We therefore utilized P2ry1 mutant mice lacking these receptors as a model to investigate the functional effects of activity-induced, Gq GPCR-mediated Ca2+ release in TPSCs. In order to study the Ca2+ response to neural activity in populations of TPSCs, we first evaluated transgene expression in TPSCs of the diaphragm muscle at postnatal day 7 (P7) from Wnt1-Cre, conditional GCaMP3 (Wnt1-GCaMP3) mice. Wnt1-Cre mice drive Cre-dependent transgene expression in neural crest derivatives, which include Schwann cells (Danielian et al., 1998). We first assessed Wnt1-Cre mice by crossing them to mice conditionally expressing the fluorescent reporter TdTomato. Robust expression of TdTomato was observed at early ages in all Schwann cells in the diaphragm, including myelinating Schwann cells of the phrenic nerve as well as non-myelinating TPSCs at the NMJ (Figure 1A), visualized using fluorescent α−bungarotoxin (α-BTX). We then crossed Wnt1-Cre mice to mice conditionally expressing GCaMP3, which encodes a green fluorescent protein (GFP)-conjugated calmodulin that fluoresces upon Ca2+ binding (Zariwala et al., 2012). In whole-mounts of P7 diaphragm muscle incubated with GFP antibodies to label GCaMP3, S100 antibodies to detect Schwann cells, and α-BTX to visualize NMJs, we observed expression of GCaMP3 in all TPSCs (Figure 1B). Together, these results show that Wnt1-Cre drives robust expression of GCaMP3 in TPSCs of the early postnatal diaphragm. Wnt1-Cre drives expression of reporters and activity sensors to Schwann cells of the neonatal diaphragm. (A) Whole mounts of P7 Wnt1-TdTomato diaphragm were labeled with 488-conjugated α-bungarotoxin (α-BTX). Myelinating Schwann cells along phrenic nerve branches as well as terminal/perisynaptic Schwann cells at α−BTX-labeled neuromuscular junctions (NMJs; green) exhibit tdTomato epifluorescence (red). (B) Higher magnification of whole mounts of P7 Wnt1-GCaMP3 diaphragm labeled with GFP, S100, and 633-conjugated α-BTX. All NMJ-associated, S100-immunostained TPSCs express GFP and thus GCaMP3. We next determined if GCaMP3 expression in TPSCs exhibited activity-induced Ca2+ responses, similar to previous studies (Jahromi et al., 1992; Reist and Smith, 1992). Imaging these responses before and after nerve stimulation at low magnification (20X), we observed large populations of TPSCs that responded to 45 s of 40 Hz tonic phrenic nerve stimulation (Figure 2A; Figure 2—video 1). 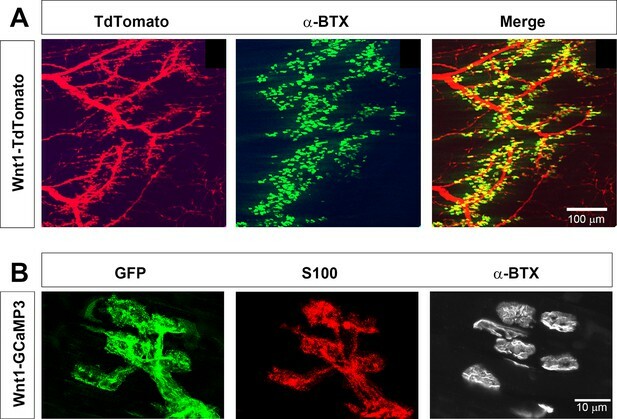 Higher magnification images (60X) showed that each individual TPSC, identified by labeling with fluorescent α-BTX (data not shown), responded to HFS (Figure 2B). We used stat maps of the standard deviation of fluorescence intensity (SD map) to spatially represent the distribution of Ca2+ transients within individual TPSCs from high-magnification videos and traces of intensity to examine their temporal characteristics (Figure 2C). The onset of these transients occurred 1.8 ± 0.74 s (n = 5, c = 54) after the initiation of HFS, reached peak intensity at 2.86 ± 0.49 s after the onset of the transient, and shortly thereafter declined in amplitude (time to 50% decay = 13.35 ± 4.22 s). Most transients lasted the entire duration of the nerve stimulation period, although the intensity at the end of the stimulation period was usually less than 10% of that at the initial peak. GCaMP3-expressing TPSCs responded to multiple stimulations, providing a useful tool to measure the effects of different stimuli on the same TPSCs. Similar to a previous study (Darabid et al., 2013), the peak intensity of Ca2+ transients observed after a subsequent 45 s bout of 40 Hz stimulation was lower than that of the first (17.3 ± 2.5 vs. 13.3 ± 1.1 dB, first vs. second stim, n = 5; p<0.05). Interestingly, analyses of transients in TPSCs across large regions of the diaphragm from low-magnification videos showed substantial variability in the onset after nerve stimulation (from 0.8 s to 4.3 s). This pattern could be achieved by differential transmitter release, differential transmitter breakdown in the perisynaptic space, or differential signal transduction in TPSCs. Because individual muscle fibers across the entire diaphragm exhibit shortening at nearly the same onset after nerve stimulation (Figure 2—video 1), this result does not appear to result from differential transmitter release. Wnt1-GCaMP3 mice exhibit activity-induced Ca2+responses in all perisynaptic glia cells of the neonatal diaphragm. (A) (Left panel) An average intensity image generated before application of a stimulus (Pre-stim) shows the overall structure of GCaMP3-expressing Schwann cell elements. (Right panel) Map of standard deviation of 16-bit fluorescence intensity units (SD iu16) of a population of TPSCs imaged in response to high-frequency nerve stimulation at low magnification; fire CLUT heatmap in SD iu16. (B) Same muscle imaged at higher power showing these fluorescence responses in individual TPSCs (left panel) were color coded (right panel). (C) These cells in B were plotted as color-coded transients. Note the relatively higher signals in this graph, compared to other graphs in this study, as a result of imaging at 60X, vs. 20X in others. (D) SD maps resulting from tonic vs. phasic HFS. (E) Transients elicited by 40 Hz tonic (red) or (blue) phasic stimulation. Peak transient intensities were statistically non-significant (14.7 ± 0.4 vs. 13.5 ± 1.3 dB; p=0.21; n = 3; c = 18), and duration was longer (time to 50% decay = 15.4 ± 0.7 vs. 22.3 ± 3.7 s; p<0.05) in response to phasic vs. tonic stimulation. (F) Slower onsets and lower amplitudes of Ca2+ transients in TPSCs stimulated with 10 vs. 40 Hz stimulation (10 Hz phasic onset = 17.92 ± 6.3; 10 Hz tonic onset = 11.78 ± 3.4 s; 40 Hz phasic onset = 0.99 ± 0.34 s; 40 Hz tonic onset = 1.0 ± 0.38 s; p<5.3*10−19, 1-way ANOVA; every individual comparison significant except 40 Hz phasic onset vs. 40 Hz tonic onset, based on q, qcrit comparisons). 10 = 10 Hz; 40 = 40 Hz; T = tonic; p=phasic. Although the diaphragm is activated by short bursts of tonic stimulation of the phrenic nerve during several behaviors (e.g., expulsive maneuvers such as wretching; Hodges and Gandevia, 2000), the more native physiological pattern of stimulation that occurs during respiration is phasic with a duty cycle between 25% and 50%, in which each period of activation is 100 ms, at frequencies between 30–70 Hz (Kong and Berger, 1986; Zhan et al., 1998; van Lunteren and Moyer, 2003; Sieck et al., 2012). The duration of TPSC Ca2+ transients was longer in response to 45 s of 40 Hz phasic vs. tonic stimulation (Figure 2E,F). The off-period of each duty cycle could clearly be discerned as a dropoff in transient intensity (Figure 2E), showing the dynamic nature of these responses (Todd et al., 2010; Darabid et al., 2013). At lower frequencies of stimulation, we observed similar differences of Ca2+ signals in response to phasic vs. tonic patterns. Interestingly, in response to 10 Hz stimulation, the lowest phasic rate that produced a measurable response, Ca2+ transients were much slower in onset after nerve stimulation than after 40 Hz stimulation (Figure 2F). We next examined whether lower frequencies were capable of inducing Ca2+ transients in TPSCs, similar to astrocytes (Sun et al., 2014). Whereas spontaneous ACh release, 1 Hz and 2 Hz evoked stimulation failed to produce visible Ca2+ transients in TPSCs, 5 Hz stimulation elicited transients in a small number of TPSCs, and 10–40 Hz stimulation produced responses in all TPSCs (data not shown). In response to different durations of 40 Hz stimulation, only several TPSCs responded to 0.1 s of nerve stimulation (i.e., four pulses), whereas all TPSCs responded to 1–30 s of 40 Hz stimulation (Figure 2—video 2). Finally, in contrast to TPSCs, myelinating Schwann cells along phrenic nerve trunks and branches failed to exhibit Ca2+ responses, similar to previous reports (Jahromi et al., 1992). However, bath application of adenosine triphosphate (ATP) or muscarine elicited a response in Schwann cells along distal phrenic nerve branches as well as TPSCs (Figure 2—video 3). Despite their expression of GCaMP3 (determined by immunohistochemistry; data not shown), myelinating Schwann cells along larger phrenic nerve branches failed to respond to either nerve stimulation or bath application of ATP or muscarine. Together, these results show that TPSCs dynamically respond to different patterns of neuronal activity. Previous studies of individual or small cohorts of TPSCs show that a variety of neurotransmitter-derived substances trigger cytosolic Ca2+ accumulation, including ACh through muscarinic AChRs, adenine nucleotides such as ATP/ADP through purinergic P2Y receptors (P2YR), and adenosine, derived from synaptic ectonucleotidase-mediated degradation of adenine nucleotides (Cunha et al., 1996), through P1R (Darabid et al., 2014). A recent study provided evidence that TPSCs also respond to nerve-derived ACh through nicotinic AChRs (Petrov et al., 2014). In contrast to these responses in adult TPSCs, a recent report demonstarted that TPSC Ca2+ signals in neonatal mouse soleus are not mediated by muscarinic or nicotinic ACh receptor (mAChR) or by adenosine receptor activation, but rather by P2YRs (Darabid et al., 2013). In agreement with this finding, we found that whereas the pan-muscarinic antagonist atropine and the pan-nicotinic antagonist curare failed to block activity-mediated Ca2+ transients in TPSCs of the P7 diaphragm (n = 8), the wide spectrum P2 antagonist suramin completely eliminated them (n = 6; Figure 3C). We tested whether this response was mediated by P2Y1 receptors (P2Y1Rs), as TPSCs reportedly express this protein (Darabid et al., 2013) and astrocytic Ca2+ signaling is mediated in part by the Gq GPCR-coupled pathway that is activated by P2Y1Rs (Fam et al., 2000). Treatment with the selective P2Y1R antagonist MRS2500 (1 μM) completely blocked activity-induced Ca2+ responses in all TPSCs of the diaphragm (n = 5; Figure 3C). In order to determine whether activity-dependent, P2Y1R-mediated Ca2+ responses were dependent on release from intracellular stores, we examined them in the presence of the sarco-/endoplasmic reticulum Ca2+-ATPase (SERCA) inhibitor cyclopiazonic acid (CPA). 15 min after treatment with CPA, these responses were completely abolished (n = 3; Figure 3C). Finally, to test whether the effect of MRS2500 was indeed mediated by P2Y1Rs, we crossed mice expressing a constitutive null mutation of the P2ry1 gene, which encodes P2Y1Rs (Fabre et al., 1999), to Wnt1-GCaMP3 mice. Nerve stimulation of P2ry1 mutants completely failed to elicit Ca2+ responses in TPSCs (n = 7; Figure 3A,C; Figure 3—video 1). Mutant TPSCs exhibited a robust response to muscarine (Figure 3A,C), indicating that the failure of activity to induce these responses was not caused by non-specific effects of the P2ry1 mutation. 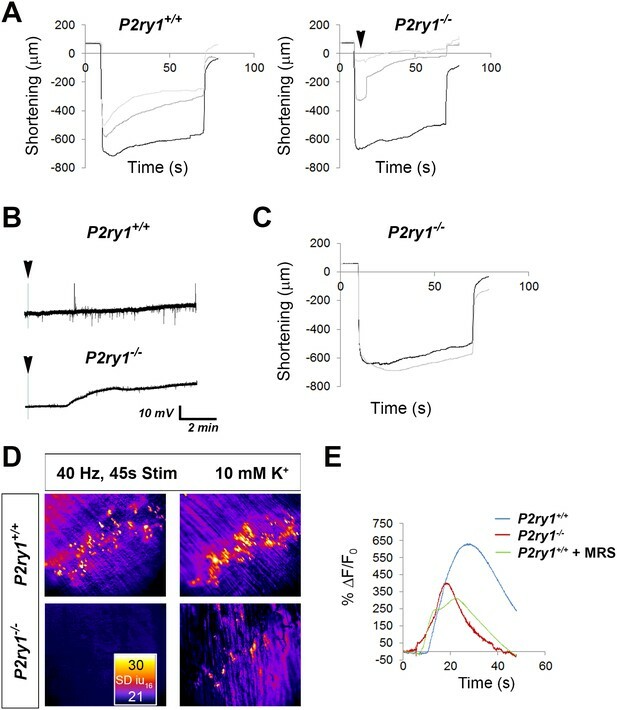 Activity-induced responses in perisynaptic glia at the NMJ are completely dependent on P2Y1R signaling. (A) SD maps of activity-induced (left panels) or muscarine-induced (right panels) Ca2+ responses in TPSCs of P2ry1 wild-type (WT; top panels) or mutant (bottom panels) diaphragm. Note the complete absence of activity-induced Ca2+ responses in TPSCs of P2ry1 mutants; fire CLUT heatmap in SD iu16. (B) Addition of neostigmine restores this response. (C) Atropine largely blocks muscarine-induced, but not nerve stimulation-induced, TPSC Ca2+ responses. (D) Graph representing the relative number of α-BTX-associated TPSCs exhibiting Ca2+ responses in response to activity or drug treatment. p<5.3*10−19, 1-way ANOVA; Nicotine treatment induced a variable response (28.3 + 13.3% of stim-activated cells activated by nicotine; variance = 176.3). (E) WT mice exhibit elevated Ca2+ responses to activity in the presence of the cholinesterase-blocking drug neostigmine (peak TPSC Ca2+ intensities, 16.3 ± 1.4 vs. 20 ± 2.3 dB, stim vs. stim + neostigmine, p<0.05; n = 4; c = 22). We were intrigued by the inability of atropine to block activity-mediated Ca2+ responses in TPSCs of P2ry1 WT mice, since (a) bath application of muscarine evoked a robust Ca2+ signal. ; (b) atropine blocked this effect of bath-applied muscarine (data not shown); (c) ACh is released upon nerve stimulation. On the one hand, this may result from the absence of clustered mAChRs in P7 TPSCs (Darabid et al., 2013). Alternatively, the lateral diffusion of nerve-derived ACh to perisynaptic TPSC-derived mAChRs may be limited by the activity of the cholinesterases acetylcholinesterase (AChE) or butyrylcholinesterase (BChE) in the synaptic cleft. Nerve stimulation of P2ry1 mutants in the presence of the pan-cholinesterase inhibitor neostigmine resulted in a robust Ca2+ response in all TPSCs, suggesting that cholinesterase activity normally prevents this effect (n = 3; Figure 3B,C). Neostigmine also increased the intensity of activity-induced Ca2+ transients in P2ry1 WT mice, demonstrating the additive nature of the effects of purinergic and muscarinic stimulation on this response (Figure 3D). We investigated which nerve-derived, P2Y1R-stimulating ligands were capable of evoking TPSC Ca2+ responses. While bath application of either ATP or ADP induced these responses, neither ADP-ribose nor β-nicotinamide adenine dinucleotide (βNAD) did (n = 4; data not shown; Mutafova-Yambolieva and Durnin, 2014). Bath application of the P1R-activating ligand adenosine also evoked robust Ca2+ transients in TPSCs (n = 3; data not shown), similar to previous studies (Robitaille, 1995; Castonguay and Robitaille, 2002). However, the onset of this response was markedly delayed, compared to that triggered by purines or ACh mimetics (ATP = 3.2 ± 1.6 s, adenosine = 15.6 ± 3.4 s; p<0.001). Together, these pharmacological and genetic studies suggest that activity-induced Ca2+ signaling in neonatal diaphragm TPSCs is mediated by adenine nucleotide-mediated stimulation of P2Y1R. This result thus permits the evaluation of the functional role of this signal. In order to test whether P2Y1R deletion itself or activity-induced P2Y1R-mediated Ca2+ signaling exerted gross effects on synaptogenesis of the NMJ, we first assessed the structure of NMJs by immunohistochemical and ultrastructural techniques. We examined the tripartite NMJ by staining whole-mounts of P7 diaphragm with antibodies against synaptophysin (nerve terminals), GFP (GCaMP3-expressing perisynaptic Schwann cells) and α-BTX (postsynaptic AChR clusters). We found no difference in the total number of NMJs, the size of NMJs, the percentage of innervated NMJs, or the apposition of perisynaptic Schwann cells in P2ry1 mutant or WT mice (Figure 3—figure supplement 1; data not shown). Next, we examined NMJs for AChE immunoreactivity, as previous reports of adult NMJs in P2ry1 mutants showed a reduction in the level of expression of this cholinesterase (Xu et al., 2015). Using a highly specific antibody that fails to detect expression of this enzyme in AChE mutant mice, we were unable to observe any difference in its expression or synaptic localization (Figure 3—figure supplement 1). Finally, we examined NMJs by electron microscopy, and found no obvious structural abnormalities (Figure 3—figure supplement 2). Together, these results suggest that the gross morphological development of the NMJ, at least until P7 in the diaphragm, is unaffected in mice lacking P2Y1R and activity-induced Ca2+ signaling. We next evaluated the effect of eliminating activity-induced Ca2+ signaling on the presynaptic release of neurotransmitter, based on results obtained in previous studies (Robitaille, 1998; Castonguay and Robitaille, 2001). The resting membrane potential (RMP) was unchanged between genotypes (−68.5 ± 5.2 vs. −68.4 ± 3.3 mV; WT vs. mutant; p=0.46; WT vs. mutant; n = 3, c = 13), and was not significantly different after vs. before a nerve stimulation bout between genotypes (data not shown). The frequency, amplitude, rise to peak, and time to 50% decay of miniature EPPs (mEPPs) were also unchanged (resting frequency: 0.38 ± 0.15 vs. 0.46 ± 0.14 events/s; p=0.11; post-stimulation frequency: 1.57 ± 0.8 vs. 2.01 ± 0.8 events/s; p=0.15; amplitude: 2.52 ± 0.5 vs. 2.49 ± 0.6 mV; p=0.44; rise to peak: 3.76 ± 1.8 vs. 3.69 ± 2.7 ms; p=0.46; time to 50% decay: 5.83 ± 2.4 vs. 4.81 ± 1.8 ms; p=0.08; WT vs. mutant; n = 3, c = 13–19). Individual nerve-evoked EPPs, recorded in the presence of μ-conotoxin, were also similar between P2ry1 WT and mutant mice (Figure 4A). In response to HFS, EPP amplitudes at the end of the period were also similar in each genotype. These results demonstrate that basal and HFS-induced ACh release are not affected in the absence of activity-induced Ca2+ signaling in TPSCs (Figure 4A,D). These results also corroborate the finding that AChE expression at the NMJ was unaffected in P2ry1 mutants, as the durations of mEPPs and EPPs were unaffected, whereas they are longer in the absence of this enzyme (Adler et al., 2011). The loss of activity-induced Ca2+responses in perisynaptic glia disrupts postsynaptic but not presynaptic function at the NMJ. (A) Phrenic nerve-evoked endplate potentials (EPPs) were measured in P7 diaphragm muscle from P2ry1 WT and mutant mice in response to basal (left panel) and high-frequency stimulation (HFS; middle and right panels). There was no difference in the amplitudes (24 ± 2.6 vs. 26.7 ± 1.5 mV; p=0.13; WT vs. mutant; n = 4; c = 16) of basal EPPs or in the amplitudes of EPPs at the end of a period of HFS. Up and downward deflections preceding each EPP are stimulation artifacts. (B) Phrenic nerve-evoked muscle action potentials (APs) were measured in P7 diaphragm muscle from P2ry1 WT and mutant mice in response to basal (left panel) and HFS (middle and right panels). There was no difference in the amplitudes (67.7 ± 7.1 vs. 67.8 ± 7.1 mV; p=0.49), the rise to peak (1.16 ± 0.2 vs. 1.07 ± 0.2 ms; p=0.33), or the time to 50% decay (2.42 ± 0.53 vs. 2.16 ± 0.82 ms; p=0.43) of basal APs, or in the percentage of successfully transmitted muscle APs at the end of a period of HFS (note the three successful APs in the WT and 2 APs in the mutant, at the end of HFS; arrowheads). (C) As shown in right panel of A, ending EPP heights are similar between genotypes (34 ± 8.6 vs. 34.3 ± 16.6% initial EPP; p=0.96; WT vs. mutant; n = 4; c = 20). (D) As shown in right panel of B, the time to 50% failure in response to HFS is similar between genotypes, in all subtypes of fatiguability (3.7 ± 1.6 vs. 2.5 ± 2.4 s for quick fatiguability; p=0.23; 22 ± 15.1 vs. 24.7 ± 13.5 s for intermediate fatiguability; p=0.67; 37.3 ± 9 vs. 37.2 ± 6.8 s for slow fatiguability; p=0.75; WT vs. mutant; n = 4; c = 27). (E) Muscle APs from the beginning (left) or end of a train of HFS from P2ry1 WT (black; +/+) or mutant (gray; -/-) mice. Muscle AP rise-to-peak was lengthened (2.0 ± 0.6 vs. 2.7 ± 0.7 ms; WT vs. mutant, p<0.05) and amplitude was reduced (58.1 ± 3.23 vs. 53.7 ± 4.5 mV; WT vs. mutant, n = 4, c = 13; p<0.05) at the end of a train of HFS. In order to assess postsynaptic function, we took advantage of BHC, a drug which blocks contraction of skeletal muscle without affecting neurotransmission and thus allows the electrophysiological and optical evaluation of muscle APs (Heredia et al., 2016). We first assessed individual nerve-evoked muscle APs and observed no differences between P2ry1 WT and mutant mice (Figure 4B). In order to determine the effects of HFS on muscle APs, we initially examined neural transmission failure, or the failure to transmit a successful EPP into a muscle AP, by identifying the time at which less than half of the nerve stimuli were transduced into successful muscle APs. Similar to the adult diaphragm (Heredia et al., 2016), P7 diaphragm exhibited multiple muscle AP profiles in response to HFS, characterized by the occurrence of failed or subthreshold APs at different timepoints after stimulation, likely reflecting differential fatiguability. We were unable to detect differences in the time to neural transmission failure in any subtype (Figure 4D), consistent with the failure to detect differences in EPP or mEPP amplitude, which reflect the presynaptic release of and the postsynaptic response to ACh, respectively. However, when we examined the features of successfully transmitted muscle APs at different stages of HFS, we found that the amplitudes were smaller and durations longer in P2ry1 mutant relative to WT mice (Figure 4E). These results suggest that the muscle AP itself, rather than the transmission of the nerve impulse to the muscle, is affected in the absence of activity-induced, P2Y1R-mediated Ca2+ responses in TPSCs. Because previous studies reported that impaired muscle APs are correlated with muscle fatigue (Juel, 1988), we evaluated muscle force in the P7 diaphragm of P2ry1 mutant and WT mice. We used an optical measure of fiber shortening in whole diaphragm to measure muscle peak force and muscle fatigue (Heredia et al., 2016). When we examined the effect of 45 s of 40 Hz phrenic nerve stimulation, we detected no difference in the magnitude of peak contraction (Figure 5A,B). However, peak contraction was maintained for longer durations in P2ry1 WT than mutant mice (Figure 5B). These results were also obtained in WT mice treated with the P2Y1R antagonist MRS2500, demonstrating that the acute inactivation of P2Y1R function is sufficient to enhance fatigue (Figure 5C). When we subjected the diaphragm to multiple bouts of HFS, each separated by a recovery period of 15 min, we found that the initial peak contraction, as well as ability to maintain peak contraction, were significantly reduced in P2ry1 mutants (Figure 5D). 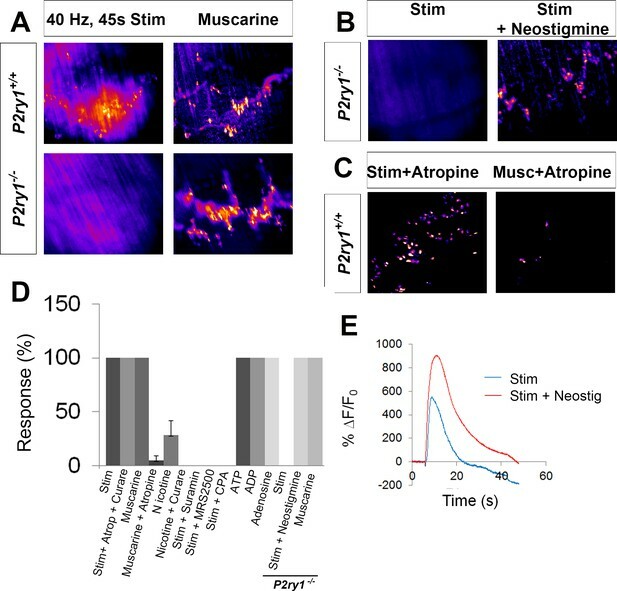 Finally, in order to test whether nerve stimulation-induced muscle fatigue was enhanced as a result of impaired neuromuscular synapse transmission, we stimulated muscle rather than nerve. We failed to observe differences in peak contraction or fatigue in response to 40 s of 45 Hz electrical field between P2ry1 WT and mutant mice (data not shown). 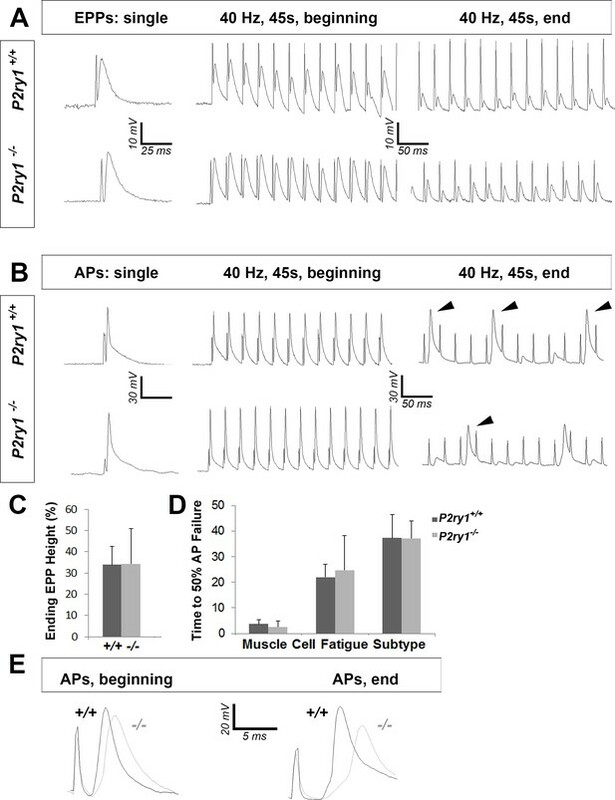 Collectively, these data demonstrate that the perisynaptic region of muscle fibers of the P7 diaphragm is more sensitive to fatigue induced by HFS in P2ry1 mutant than WT mice. The loss of activity-induced Ca2+responses in perisynaptic glia leads to enhanced muscle fatigue. (A) Images of a P7 hemi-diaphragm before phrenic nerve stimulation, at peak contraction, and during fatigue. Black and white arrows indicate sites used to compare fiber length changes. (B) The shortening of muscle fibers, as measured by the change in distance between the two sites indicated by arrows in A, is represented as a negative number. Peak length changes (shortening) are similar between genotypes (751.6 ± 136 μm vs. 726 ± 182 μm; p=0.75), but are maintained significantly less over time in P2ry1 mutants (ending length change = 72.6 ± 7.3 vs. 61.5 ± 9.5% peak length change; n = 9; P2ry1 WT vs. mutant; *p<0.05). (C) Fatigue is also enhanced by acute blockade of TPSC Ca2+ responses with the P2Y1R antagonist MRS2500 (ending length change = 63.7 ± 10.8 vs. 51.4 ± 5.3% peak length change; n = 4; untreated vs. MRS2500-treated; *p<0.05; data in graph presented as the failure to maintain peak shortening or 100% minus these values). (D) Peak length changes in response to the seventh bout of HFS are reduced in P2ry1 mutants (664.6 ± 43.7 μm vs. 564.4 ± 64.1 μm; *p<0.05), as is fatigue (ending length change = 74.5 ± 13.6 vs. 61.3 ± 5.8% peak length change; n = 4; P2ry1 WT vs. mutant; *p<0.05). (E) Image of transverse section of P7 diaphragm from P2ry1 WT and mutant mice, stained with antibodies against myosin heavy chain (MHC) Type I (blue), MHC Type IIA (green) and MHC Type IIB (red) antibodies (left panel). No difference between genotypes was observed in the number of each MHC muscle fiber subtype (15 ± 3 vs. 13 ± 3, p=0.46; Type I; 50 ± 6 vs. 49 ± 5, p=0.83; Type IIa; 8 ± 2 vs. 7 ± 2, p=0.59; Type IIb; 26 ± 4 vs. 31 ± 5, p=0.36; Type IIx; all values are P2ry1 WT vs. mutant; n = 3). We next examined muscle fiber subtype in the diaphragm, since muscle AP failure profiles with different fatiguability were observed in response to HFS, and since the development of these subtypes reflects the endogenous pattern of nerve stimulation. Although earlier studies indicate that the development of these fiber subtypes first occurs at around P25 in rodent diaphragm (Zhan et al., 1998), we observed that both P2ry1 WT and mutant mice contained all four basic fiber subtypes at P7, as assessed by immunostaining with myosin heavy chain (MHC) antibodies that selectively recognize each fiber subtype (Bloemberg and Quadrilatero, 2012). However, the relative percentage of each of these subtypes was indistinguishable between genotypes, suggesting that the enhanced fatigue in P2ry1 mutants is not caused by a relative increase in fast-fatiguing subtypes of muscle fibers (Figure 5E). A recent study demonstrated that neonatal TPSCs respond to distinct levels of nerve activity during the period of polyneuronal synapse elimination by modulating the magnitude of their Ca2+ response (Darabid et al., 2013). Together with the finding that TPSC processes separate competing nerve terminals from each other and from the postsynaptic muscle fiber during this period (Smith et al., 2013), these data suggest that TPSC Ca2+ responses may regulate this phenomenon. Further support for this idea comes from the finding that synapse elimination in the CNS is impaired in P2ry1 mutant mice as well as in mice lacking activity-induced Ca2+ responses in astrocytes (Yang et al., 2016). In order to evaluate this hypothesis, we confirmed that Ca2+ responses were eliminated in the absence of P2Y1R signaling at P15, the age at which synapse elimination is largely complete. Similar to those at P7, TPSC Ca2+ responses at P15 were completely dependent on P2Y1R signaling, both in P2ry1 WT mice treated with MRS2500 or in P2ry1 mutant mice (Figure 6A,B). Fatigue was similarly enhanced, using both optical and tension measurements (Figure 6C). However, when we examined NMJs by neurofilament immunohistochemistry to detect the numbers of innervating axons at individual NMJs at several ages between P7 and P15, we were unable to observe any differences (Figure 6D,E). Together, these results suggest that activity-induced Ca2+ responses in TPSCs are not required for polyneuronal synapse elimination in the developing diaphragm. The loss of activity-induced Ca2+responses in perisynaptic glia does not affect the rate or magnitude of polyneuronal synapse elimination. (A) Pharmacological or genetic disruption of P2Y1R signaling completely blocks activity-induced TPSC Ca2+ responses at P15: P2ry1 WT mice exhibited nerve stimulation-induced responses that were blocked after treatment with 1 μM MRS2500 (left images). P2ry1 mutant mice failed to exhibit nerve stimulation-induced Ca2+ responses in TPSCs but exhibited robust responses to bath-applied muscarine (right images). (B) Peak TPSC Ca2+ intensities in response to these manipulations: (5.4 ± 1.2 vs. 1.5 ± 0.56 dB, WT stim vs. mutant stim, p<0.005; 5.4 ± 1.2 vs. 0.1 ± 0.04 dB, WT stim vs. WT stim +MRS2500, p<0.0001; 15.6 ± 0.7 vs. 1.5 ± 0.56 dB, mutant stim vs. mutant +muscarine, p<0.0001, Student’s t with Bonferonni correction; c > 10 per n; n = 3–4; fluorescence units from fire CLUT heatmap in SD iu16. (C) Fatigue is enhanced in P15 P2ry1 mutants using optical measures (ending length change = 75.9 ± 8 vs. 58.6 ± 11.6% peak length change; n = 3; P2ry1 WT vs. mutant; p<0.05) or tension recording (ending force = 39.2 ± 5.1 vs. 32.3 ± 4.3% peak force; n = 3; P2ry1 WT vs. mutant; p<0.05). Drop in force occurs earlier in mutant vs. WT (arrows). (D) Polyneuronally innervated NMJs from a P7 P2ry1 mutant diaphragm; red = AlexaFluor 594-labeled α-BTX to label AChRs; green = neurofilament immunostaining to label presynaptic nerve terminals. (E) The number of polyneuronally innervated NMJs is similar between P2ry1 WT and mutant mice (P7: 65 ± 9 vs. 59 ± 13%, p=0.41; P11: 18 ± 5 vs. 15 ± 3%, p=0.34; P15: 2 ± 2 vs. 5 ± 3%, p=0.19 polyneuronally innervated NMJs; n = 5; P2ry1 WT vs. mutant). A variety of mechanisms underlie muscle fatigue. In order to assess which of these might be affected by TPSC Ca2+ accumulation, we initially examined intracellular Ca2+ release within muscle cells. In order to investigate activity-induced Ca2+ signaling in whole populations of diaphragm muscle cells, we crossed Myf5-Cre to conditional GCaMP3 mice. In unparalyzed muscle under epifluorescence, we measured both fiber length changes and Ca2+ fluorescence intensities in response to HFS. Similar to the results obtained with brightfield recordings obtained above, MRS2500 enhanced the fatigue of a second bout of HFS relative to a first, compared to no treatment (data not shown). Peak intensities and time to 50% decay of Ca2+ transients were significantly affected in response to HFS in the presence of MRS2500 (Figure 5—figure supplement 1), suggesting that events upstream or concurrent with Ca2+ release mediate muscle fatigue caused by the absence of TPSC Ca2+ signaling. We also used Myf5-GCaMP3 mice to test whether nerve-derived purines were capable of eliciting Ca2+ responses in muscle cells, similar to previous results (Choi et al., 2001). In response to 100 μM ATP, muscle cells of the diaphragm of P7 Myf5-GCaMP3 mice failed to exhibit such a response (Figure 5—figure supplement 1). Direct electrical stimulation of skeletal muscle produces fatigue, similar to indirect, nerve-mediated excitation. Interestingly, in response to high levels of extracellular potassium or high [K+]o, this activity-induced fatigue is enhanced, and muscle APs exhibit lower amplitudes and longer durations (Cairns et al., 2015), similar to the response of P2ry1 mutants to nerve activity shown above. These results raise the possibility that activity-induced Ca2+ signaling in TPSCs protects against muscle fatigue by regulating K+ uptake by these cells and therefore persiynaptic [K+o]. similar to reports of other perisynaptic glia (Wang et al., 2012a, Wang et al., 2012b). In order to test this idea, we first challenged diaphragms to [K+]o greater or less than normal levels (5 mM). These challenge experiments were modeled on those used to characterize the effects of hypo- and hyperkalemia on skeletal muscle function (Wu et al., 2011). We found that HFS-induced fatigue was disproportionately enhanced in P2ry1 mutant, relative to WT, mice in response to 10 mM [K+]o (Figure 7A). The enhanced fatigue in these mutants was further revealed by multiple bouts of HFS; P2ry1 mutant diaphragm was almost completely unable to contract after the second period of HFS in high [K+]o, in marked contrast to P2ry1 WT diaphragm (Figure 7A; Figure 7—video 1). We next examined whether the effect of high [K+]o was caused by depolarization of the postsynaptic muscle membrane. After stimulation with several bouts of HFS in 5 mM [K+]o, muscle cells were impaled and recorded before and after changing the [K+]o to 10 mM. While this caused a mild depolarization of the RMP in P2ry1 WT mice, this effect was enhanced in P2ry1 mutants (Figure 7B). Conversely, HFS-induced fatigue was modestly but not significantly ameliorated in response to low [K+]o in P2ry1 mutants (Figure 7C). Collectively, these results demonstrate that P7 diaphragm muscle cells lacking activity-induced, P2Y1R-mediated Ca2+ signaling in TPSCs are more sensitive to high [K+]o, suggesting that Ca2+ signaling modulates the response to [K+]o in these perisynaptic glia. High [K+o] triggers greater muscle fatigue, greater muscle membrane depolarization, and reduced Ca2+responses in the absence of activity-induced Ca2+responses in perisynaptic glia. (A) Muscle length changes from P7 diaphragm of P2ry1 WT (left) and mutant (right) mice were first recorded in response to HFS in normal or 5 mM [K+]o (black traces), and then recorded in response to 2 bouts of HFS (60 Hz, 45 s) in 10 mM [K+]o (dark and light grey traces = 1st and 2nd HFS, respectively). Peak length changes and fatigue are dramatically affected in P2ry1 mutants by high [K+o]: peak length in response to first HFS in 10 mM [K+]o as a percentage of peak length in response to control HFS in 5 mM [K+]o = 93 ± 20.7 vs. 53.8 ± 24%; n = 3; P2ry1 WT vs. mutant mice, p<0.05; peak length change in response to second HFS in 10 mM [K+]o = 74.2 ± 15.5 vs. 20.9 ± 11% control HFS; n = 3; P2ry1 WT vs. mutant mice; p<0.005; asterisk indicates this almost complete failure to contract; fatigue, or ending length change of second HFS in high 10 mM [K+]o = 41.3 ± 17.8 vs. 7.4 ± 6.8 peak length change of first HFS in 5 mM [K+]o; n = 3; P2ry1 WT vs. mutant mice, p<0.05). (B) Muscle length changes in P2ry1 mutants in response to HFS in lowered [K+]o show a statistically non-significant trend toward less fatigue (ending length change, 2.5 mM [K+]o (grey trace) vs. 5 mM [K+]o (black trace)=75.1 ± 6.2 vs. 83.9 ± 12.9% peak length change; n = 3, p=0.17). (C) Effect of high [K+]o on resting membrane potential (RMP). Representative muscle cell recording before and after (arrowhead) [K+]o was changed from 5 to 10 mM in P7 diaphragm from P2ry1 WT (left) and mutant (right). (D) SD intensity maps of TPSCs in response to HFS (left panels) in P2ry1 WT (upper) and mutant (lower) mice and in response to subsequent treatment with 10 mM [K+]o (right panels). Markedly fewer TPSCs responded to elevated [K+]o in P2ry1 mutants. (E) Peak Ca2+ transient intensities of TPSCs responding to 10 mM [K+]o after 3 bouts of HFS were significantly reduced in P2ry1 mutants or in WT mice treated with the P2Y1R antagonist MRS2500 (18.6 ± 2.5 vs. 14.5 ± 1.5 dB, WT vs. mutant, p<0.05, c > 10 per n; n = 4, Student’s t with Bonferonni correction; 18.6 ± 2.5 vs. 13.8 ± 0.8 dB, WT vs. WT + MRS2500, p<0.01, c > 10 per n; n = 4, Student’s t with Bonferonni correction; fluorescence units from fire CLUT heatmap in SD iu16). To test if TPSCs respond to and/or regulate K+ at the NMJ, we examined the response of these cells to changes of [K+]o. Interestingly, we found that raising [K+]o to 10 mM resulted in a robust TPSC Ca2+ response (Figure 7D). This was not mediated by indirect depolarizing effects of [K+]o on the phrenic nerve, leading to an activity-induced, P2Y1R-mediated Ca2+ response, because it was still observed in the presence of doses of tetrodotoxin that blocked neurotransmission, and because it was also observed in P2ry1 mutants completely lacking activity-induced Ca2+ responses. In other words, these responses were observed in the absence of nerve stimulation. Interestingly, Ca2+ responses induced by high [K+]o were not caused by influx of extracellular Ca2+ into TPSCs, because they were still observed when external Ca2+ was removed, but rather by release from intracellular stores, because they were abrogated after treatment with CPA (n = 3; data not shown). In order to determine if TPSCs directly respond to manipulations of [K+]o, we performed whole cell voltage recordings of these cells, identified by GCaMP3 expression in P7 Wnt1-GCaMP3 mice and co-localization with α-BTX-labeled NMJs. We observed that the RMP of TPSCs depolarized in response to treatment with 10 mM KCl by an amount that was close to that predicted by the Hodgkin-Goldman-Katz equation (data not shown). Therefore, these data demonstrate that TPSCs are capable of taking up K+ and that elevations of [K+]o depolarize TPSCs, leading to a release of Ca2+ from intracellular stores, similar to depolarization-induced intracellular Ca2+ release reported in neurons (Ryglewski et al., 2007). If K+ uptake is affected in TPSCs of P2ry1 mutants lacking activity-induced Ca2+ signaling, then this [K+]o-induced Ca2+ response in these cells might in turn be affected. In order to test this idea, we subjected diaphragms to several bouts of HFS, separated by 15 min, to mimic the effects on muscle fatigue described above, then assessed the effects of high [K+]o on Ca2+ signaling. In contrast to P2ry1 WT mice, mutants or WT mice treated with MRS2500 showed a markedly reduced Ca2+ response to 10 mM [K+]o (Figure 7D,E), suggesting that K+ uptake is impaired in P2ry1 mutants. This failure of TPSCs to regulate perisynaptic [K+]o may contribute to the enhanced muscle fatigue that occurs in P2ry1 mutants lacking activity-induced TPSC Ca2+ responses. Additionally, these results suggest that TPSC Ca2+ responses, and consequently K+ uptake, are positively regulated by nerve activity through feedforward (i.e., neurotransmitter-mediated stimulation) and feedback mechanisms (i.e., by suprathreshold [K+]o itself. Our results using Wnt1-GCaMP3 mice demonstrate that activity-induced Ca2+ signaling in neonatal TPSCs of the diaphragm is mediated by P2Y1R activation by nerve-derived adenine nucleotides. The absence of Ca2+ signaling within TPSCs does not appear to affect the structural and molecular development of the NMJ, nor does it alter the presynaptic release of neurotransmitter, but rather affects the postsynaptic AP during sustained HFS, where longer, smaller APs were correlated with a failure to maintain peak muscle force. Because previous studies observed that administration of high K+ induced similar effects on muscle APs subjected to fatiguing muscle stimulation (Cairns et al., 2015), we examined muscle fatigue in response to this treatment and found that it was enhanced to a greater degree in P2ry1 mutants lacking activity-induced Ca2+ signaling. This heightened susceptibility to high [K+]o may be caused by impaired K+ uptake by P2ry1 mutant TPSCs, as these cells exhibited a markedly reduced release of Ca2+ from intracellular stores in response to high [K+]o treatment. Collectively, these results suggest that activity-induced, P2Y1R-mediated Ca2+ signaling in TPSCs influences muscle fatigue by regulating perisynaptic [K+]o (Figure 8). Proposed model by which nerve stimulation-induced Ca2+responses in TPSCs regulate muscle fatigue. Upon stimulation, presynaptic motor axon terminals (green) release acetylcholine (ACh) from synaptic vesicles (SVs), which elicits endplate potentials via postsynaptic nicotinic ACh receptors (nAChR), followed by activation of voltage-gated sodium channels (VGSC), leading to action potentials and contraction of muscle (brown). Nerve terminals also release ATP, which as itself or ADP stimulates in TPSCs (yellow) the release of calcium (Ca2+) from intracellular stores via P2Y1 receptors (P2Y1R). This signal leads to the movement into TPSCs of perisynaptic potassium (K+), produced by both neurons and muscle cells in response to stimulation. This regulation of perisynaptic K+ levels by TPSCs is proposed to reduce the inactivation of VGSCs by K+ in the neuromuscular synapse during repetitive stimulation, thus reducing muscle fatigue. The current study represents the first evaluation of Ca2+ responses using genetically encoded calcium indicators in perisynaptic glia at the NMJ. The onset after nerve stimulation and time to peak intensity of Ca2+- transients using this method are similar to those of published studies using Ca2+- sensitive dyes in TPSCs loaded with Fluo-3 as well as astrocytes expressing GCaMP3 (Jahromi et al., 1992; Reist and Smith, 1992; Darabid et al., 2013; Akerboom et al., 2013), demonstrating that this genetic technique is a valid tool to measure these responses in large populations of TPSCs. The most striking finding from this study is the complete dependence of TPSC Ca2+- responses on a single GPCR, P2Y1R. Therefore, despite the fact that bath administration of a multiple substances induces widespread Ca2+ signaling in neonatal TPSCs, activity-induced responses are only mediated by adenine nucleotides. In contrast to these results, studies of adult TPSCs support a role for ACh and other factors in mediating these responses (Darabid et al., 2014). Therefore, the early exclusive dependence on P2Y1R-activating adenine nucleotides may broaden over time. Alternatively, TPSCs at the NMJs of the diaphragm may continue to depend exclusively on P2Y1R signaling. At the oldest ages at which we were able to examine population responses (P15-P20), activity-induced Ca2+ signals were completely dependent on the P2Y1R pathway, supporting this latter idea. Moreover, the prevention of ACh diffusion to perisynaptic mAChRs by cholinesterase is unlikely to represent a developmentally transient response. Indeed, a recent report described a functional role for TPSC-derived BChE at the adult NMJ (Petrov et al., 2014). Our results fail to support the idea that TPSC Ca2+ responses affect the presynaptic release of ACh, in contrast to previous studies (Robitaille, 1998; Castonguay and Robitaille, 2001). NMJs at the diaphragm do exhibit dynamic changes of ACh release such as facilitation and depression (Vautrin et al., 1993), arguing against the absence of plasticity at diaphragm NMJs as an explanation of these differences. Rather, they may be attributable to different species, muscle, age or technique. Interestingly, using a similar genetic approach to study the effect of eliminating activity-induced Ca2+ responses in astrocytes neurotransmitter release was unaffected (Agulhon et al., 2010). On the other hand, postsynaptic function was affected at the NMJ in response to HFS in P2ry1 mutants. Whereas the number of successful muscle APs, reflecting the presynaptic release of and response to ACh, was not different in response to HFS, the characteristics of these APs changed significantly in response to prolonged nerve stimulation. These results suggest that muscle APs may not be transduced as efficiently in P2ry1 mutant mice. The reduced intensity of muscle Ca2+ transients in response to pharmacological blockade of P2Y1Rs supports this contention, as does the enhancement of muscle fatigue in response to pharmacological or genetic inhibition of this pathway. These effects may result from the absence of P2Y1R function in muscle, as the mice used in this study were constitutive mutants. For example, Choi et al. (2001) found that stimulation of chick muscle fibers with 100 μM ATP triggered Ca2+ release from intracellular stores, a response blocked by the pan-P2 blocker suramin. Together with the expression of P2Y1R by muscle, these findings suggest that nerve-derived ATP may modulate intracellular muscle Ca2+ levels and thus muscle fatigue. However, we failed to observe Ca2+ release in response to ATP in the muscle cells of Myf5-GCaMP3 mice. Moreover, Ca2+ signals in TPSCs were observed in response to treatment with lower doses of ADP/ATP (10–20 μM) than those used to evoke these signals in chick muscle cells. Finally, Ca2+ signals in TPSCs were blocked after P2Y1R was blocked by specific pharmacological and genetic tools, rather than the pan-P2R blocker suramin (Choi et al., 2001). Thus, we favor the idea that the reduction of muscle cell Ca2+ mobilization in P2ry1 mutants is caused by the absence of this protein in TPSCs rather than in muscle cells. The effects of HFS on muscle APs suggested the possibility that perisynaptic [K+]o was dysregulated in P2ry1 mutants. Supporting this idea, treatment with high [K+]o enhanced muscle fatigue to a greater extent in P2ry1 mutant than in WT mice. Together with a report that intense exercise increases [K+]o in muscle to 10–14 mM (Mohr et al., 2004), a level sufficient to cause muscle fatigue (Sjøgaard, 1990); but see Shushakov et al., 2007), these data indicate that muscle fatigue is enhanced in P2ry1 mutants as a result of elevated perisynaptic [K+]o, caused by a failure of TPSCs to spatially buffer or take up K+ (Kofuji and Newman, 2004). In order to test this idea, we examined the effects of treatment with high [K+]o, reasoning that if K+ uptake mechanisms in TPSCs were impaired in P2ry1 mutants lacking activity-induced Ca2+ signaling, these effects would be diminished. Indeed, we found that Ca2+ responses to 10 mM [K+]o were markedly reduced in these mutants, providing indirect evidence that K+ uptake was impaired. Interestingly, elevation of [K+]o to 20 mM also induced a robust increase of intracellular Ca2+ in cultured astrocytes (Duffy and MacVicar, 1994). However, in contrast to the current study, this response was mediated entirely by external influx through voltage-gated Ca2+ channels (VGCC). Therefore, K+-induced Ca2+ responses in TPSCs do not appear to result from depolarization-mediated ingress through VGCC, but rather by the release from intracellular stores. Together, these data suggest that activity stimulates perisynaptic K+ uptake in TPSCs by both feedforward Ca2+ responses initiated by neurotransmitter and feedback signals initiated by high [K+]o itself. The intracellular uptake of K+ has been demonstrated in Müller glia in the retina (Newman et al., 1984) as well as in other glial subtypes and may be mediated by several mechanisms, including inwardly-rectifying potassium channels (Kir), Na+, K+ ATPases, and Na+, K+ Cl- cotransporters. The importance of perisynaptic K+ regulation by glial cells has been demonstrated by several genetic studies. For example, mice lacking Kir4.1 in astrocytes exhibit impaired K+ and neurotransmitter uptake, leading to seizures, ataxia and early lethality (Djukic et al., 2007). In contrast, Wang et al. (2012b) observed that activity-induced Ca2+ responses in astrocytes are required for K+ uptake through an ouabain-sensitive Na+, K+ ATPase activity. Future studies will determine which if any inward K+ conductance is expressed in and stimulated by activity within TPSCs, as well as the mechanisms by which increases of intracellular Ca2+ lead to enhanced K+ uptake. Of note, it has been established that nonmyelinating Schwann cells in sympathetic nerves possess Kir currents that are sensitive to neural activity (Konishi, 1994). In addition to [K+]o, the extracellular concentrations of other ions are dysregulated during muscle fatigue, including [Na+]o and [H+]o (Allen et al., 2008). Because astrocytes express an abundance of transporters and ion channels that modulate the levels of these ions in response to neuronal activity, TPSCs may similarly regulate these ions in response to stimulation of muscle, in addition to [K+]o. On the other hand, muscle itself is equipped for this role, expressing an abundance of ion channels and transporters along the extensive t-tubule system that regulate muscle membrane potential and excitability during activity (Fraser et al., 2011). However, the importance of ionic homeostasis at the NMJ may depend on additional mechanisms, such as those proposed here. For example, the sensitivity of Nav1.4, which is expressed at high levels in a restricted region in the depths of the postsynaptic junctional folds (Stocksley et al., 2005), to the inactivating effects of depolarization (Cannon, 2015), may require enriched expression of [K+]o buffering proteins by TPSCs (Figure 8). Consistent with this idea, P2ry1 mutants did not exhibit enhanced fatigue in response to direct muscle stimulation. In summary, we have utilized the diaphragm of neonatal P2ry1 mutant mice as a model to explore the functional significance of activity-induced Ca2+ signals in perisynaptic glia. We found that in the absence of purinergic signaling, postsynaptic rather than presynaptic function was altered, leading to enhanced muscle fatigue in response to HFS. These effects were correlated with elevated [K+]o and reduced responsivity to [K+]o, suggesting that activity-induced Ca2+ responses in TPSCs regulate perisynaptic [K+]o. Future studies will determine the mechanisms underlying K+ uptake and [K+]o-mediated Ca2+ accumulation in TPSCs. Such mechanisms may represent important translational targets in diseases with altered [K+]o. For example, in patients with hyperkalemic periodic paralysis, a genetic disorder caused by Scna4 mutations and characterized by elevated [K+]o, stimulation of Ca2+ signaling and subsequently [K+]o buffering within TPSCs may enhance neuromuscular function. P2ry1 mutant, GCaMP3 or GCaMP6f conditional knockin, and Wnt1-Cre and Myf5-Cre transgenic mice were all purchased from Jax. P2ry1 null mutant mice were backcrossed into the C57/Bl6 strain several times before crossing to other strains, each of which is maintained in the C57/Bl6 strain. We could find no difference in any experiment between P2ry1+/+ and P2ry1+/- mice, so we pooled these samples and denoted them all in the text as ‘WT.’ Similarly, we found no difference between male and female P2ry1+/-mice, so we pooled these samples. In order to generate P2ry1 mutants expressing GCaMP3 in Schwann cells, we generated Wnt1-Cre; P2ry1+/- and Rosa26-GCaMP3flox/flox; P2ry1+/- mice and crossed them, such that all P2ry1 mutant and heterozygote mice expressed only one copy each of Cre and GCaMP3. We used a slightly modified common 3’ WT primer to genotype P2ry1 mutant mice (ATT TTT AGA CTC ACG ACT TTC) and the recommended primers by Jax for all other alleles. All studies were performed with animals aged postnatal day 7 and 15 (P7, P15). To verify knockouts, we performed RT-PCR on muscle-derived RNA with primers against a 300 bp fragment of P2ry1 (5’: CTG TGT CTT ATA TCC CTT TCC, 3’: CTC CAT TCT GCT TGA ACT C). Animal husbandry and experiments were performed in accordance with the National Institutes of Health Guide for the Care and Use of Laboratory Animals and the IACUC at the University of Nevada. The following reagents were used at the following concentrations: P2Y1R agonists ATP and ADP (Sigma; 10 or 20 μM); P2Y1R antagonist MRS2500 (Tocris; 1 μm); P1R agonist adenosine (Sigma; 100 μM); pan-P2 antagonist suramin (Sigma; 100 μM); pan-muscarinic agonist muscarine (Sigma; 10 μM); pan-muscarinic blocker atropine (Sigma; 10 μM); pan-nicotinic agonist nicotine (Sigma; 50 μM); pan-nicotinic antagonist curare (Sigma; 200 μM); pan-cholinesterase inhibitor neostigmine (Sigma; 1 μM); sarco-/endoplasmic reticulum Ca2+-ATPase (SERCA) inhibitor, cyclopiazonic acid (Sigma; CPA; 10 μM); potassium chloride (Sigma; 2–10 mM); GIIIb μ-conotoxin (Peptides International; 2.3 μM); skeletal muscle myosin-blocker 3-(N-butylethanimidoyl)−4-hydroxy-2H-chromen-2-one (BHC; Hit2lead; 100 μM); 488-, 594-, 633-conjugated-α-bungarotoxin (α-BTX; Biotium; 1 μg/mL). The diaphragm of Wnt1-GCaMP3 mice was illuminated with a Spectra X light engine (Lumencor). In order to quantify maximal fluorescence (Fmax) exhibited by GCaMP3 in Schwann cells, 30 μM CPA was added to deplete sarcoplasmic reticular Ca2+ stores (Heredia et al., 2016). Image sequences were captured using an Andor Neo sCMOS camera and a Windows-based PC using Nikon NIS Elements 4.1. Image sequences were recorded at 25 frames per second, and were exported as 8-bit TIFF files into custom-written software (Volumetry G8d; logic underlying methods in Source code file 1). A Gauss filter (3 × 3 pixel, sd = 1.0) was applied to reduce camera noise, and motion-correction routines were used to stabilize neural and Schwann cell elements in the movie (see Hennig et al., 2015). Changes in background fluorescence were stabilized by subtracting the average intensity near the main phrenic nerve branch. An average intensity image was generated before stimulus application (‘Pre-stim’ ~1 s) to quantify basal Ca2+ levels in Schwann cells. These images are presented using a blue->green color lookup table (CLUT). This image was subtracted from the entire movie, thereby filtering out static fluorescent structures and displaying only objects that changed their intensity, i.e., Ca2+ transients. A number of statistical maps (stat maps) were used to portray and analyze the pattern of activity-induced Ca2+ transients in TPSCs. The main stat map type used to portray the amplitude of Ca2+ transients in TPSCs was the standard deviation (SD) map. This map was calculated in similar fashion to the average intensity image, except the standard deviation of 16-bit fluorescence intensity units (SD iu16) at every pixel prior to the application of the stimulus (0.5–1.0 s) extending to 60 s was calculated. Intensity SD projections (SD iu16) were used to portray changes in Ca2+-induced fluorescence as they are more descriptive of the overall changes in intensity during the recording; average intensity projections (iu16) can be somewhat misleading depending on how much of the ‘non-active’ time before and after an event is included in the average. Intensity averages also don’t describe how much the signal fluctuates. Per pixel maximum or maximum-minimum calculations can also be misleading as they include the maximum noise amplitude and/or artifacts (i.e., shot noise). SD remedies these issues, as it describes intensity fluctuations (noise or event) in standardized units and it is less sensitive to the time periods chosen to perform the projection/s. Overall, this approach isolates actively fluorescing structures more clearly than other types of projections. SD maps were color coded using a ‘Fire’ CLUT. Drugs were either bath applied in proximity to the motor endplate or pressure injected (PDES-O2DX; NPI Electronic). Drugs dissolved in DMSO were either perfused in or diluted in 1 mL of Kreb’s-Ringer’s before bath application, as bath application of small volumes of DMSO (~8 μl into 8 ml chamber) caused fluorescence within Wnt1-GCaMP3-expressing TPSCs. For experiments with altered potassium, a stock solution of 3M [KCl] was added to the bath to change the concentration from 5 mM to 10 mM immediately prior to imaging. Diaphragms were dissected and pinned on a 6 cm Sylgard-coated dish containing oxygenated Krebs-Ringer’s solution at RT according to standard procedure. Stimulation and recording of intracellular potentials were performed as described (Heredia et al., 2016). Briefly muscle APs were recorded after treatment with 100 μM BHC for 30 min, followed by 30 min of washing. Endplate potentials (EPPs) were recorded after treatment with the Nav1.4 antagonist μ-conotoxin GIIIb (μ-CTX; 2.3 μM). Signals were amplified, digitized, recorded and analyzed as described (Heredia et al., 2016). The temporal dynamics of EPPs (rise to peak; time to 50% decay) were recorded as gross approximations of endplate current (EPC) kinetics changes, as has been done previously in the presence or absence of cholinesterase inhibitors (Fatt and Katz, 1951; Beránek and Vyskocil, 1968; Kuba and Tomita, 1971). Only muscle fibers with resting membrane potentials between −60 and −75 mV were included for analysis. Stimulation episodes of the phrenic nerve over 10 Hz were separated by 30 min rest periods to allow recovery. In order to calculate percent failure (APs) or percent transmitter release rundown (EPPs), the average of three potentials at a particular timepoint (e.g., the time at which fewer than half of nerve stimuli produced a successful muscle AP) was taken and expressed as a percent of the average of the first three potentials. For experiments with altered KCl, NaCl was adjusted accordingly to maintain the same Cl- concentration before being perfused into the dish. For recording of whole cell membrane potential, diaphragms from Wnt1-GCaMP3 mice were treated with 10 mg/ml collagenase for 30 min at 37°C. 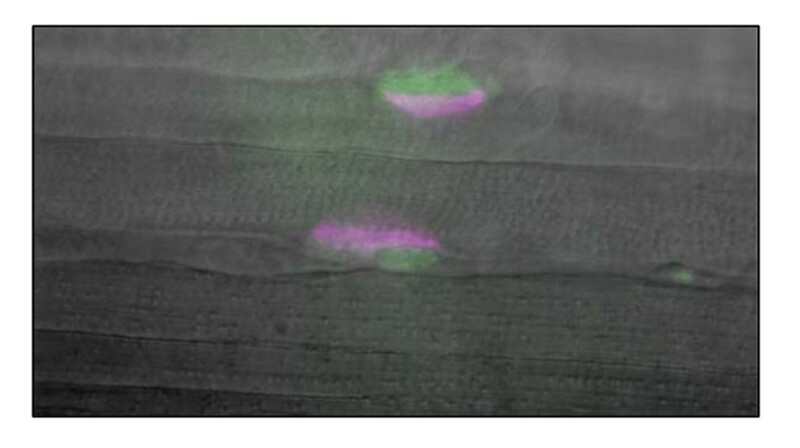 TPSCs near the surface were identified by green fluorescent GCaMP3 signal in somatic cytosol, located adjacent to red fluorescent α-BTX-stained endplates. Whole cell recording configuration was achieved using 2 μm borosilicate pipettes pulled to 5–7 mΩ tip resistance. Whole cell access was 8–20 mΩ, and leak current was <-50 pA when voltage-clamped at −60 mV command potential. Pipette internal solution contained (in mM): 97.5 K-gluconate, 32.5 KCl, 40 HEPES, 12 Na-phosphocreatine, 2 MgATP, 0.5 GTP, and 0.5 EGTA. Voltage recordings were made using current-clamp mode (I = 0) on a HEKA EPC 10 amplifier controlled by Patchmaster software. Current injection steps of 100 ms duration were given in increments between −200 to +700 pA. [K+]o. was then altered by superfusion of bath solution from 5 to 10 mM KCl to determine if a potassium conductance existed in these cells at resting membrane potential. Tension recording of muscle force in diaphragm strips (P15) or video recording of muscle shortening in hemidiaphragms (P7, P15) in response to nerve or muscle stimulation was performed as described (Heredia et al., 2016). For experiments with altered KCl, NaCl was adjusted accordingly to maintain the same Cl- concentration before being perfused in. Antibodies against GFP (Rockland), S100 (Dako), synaptophysin (Santa Cruz), neurofilament (Millipore) and acetylcholinesterase (kindly provided by P. Taylor, UCSD) were used at 1/1000 in PBS containing 1% triton-X and 10% fetal bovine serum to detect proteins in fixed, whole-mount diaphragms. Fluorescently-conjugated α-BTX and fasciculin-2 were added with secondary antibodies. Tissues were confocally imaged with an Olympus Fluoview 1000. For myosin heavy chain staining, muscles were fresh-frozen, cut at 16 μm, and immediately incubated without fixation in PBS with primary antibodies as described (Heredia et al., 2016). P7 mice were transcardially perfused in 1.5% glutaraldehyde, 2% paraformaldehyde in 0.1M sodium cacodylate. The costal diaphragm was dissected and incubated in fixative at 4°C overnight and then in rinse for several hours at 4°C. Samples were post-fixed in 2% osmium tetroxide, dehydrated, incubated in propylene oxide, embedded in Spurr’s resin and polymerized at 60°C overnight. Ultrathin sections were cut at 90 μm and stained with uranyl acetate followed by lead citrate. Sections were photographed or digitized using a Phillips CM10 transmission electron microscope equipped with a Gatan BioScan digital imaging system. Power analyses were performed using G*power 3.010 to determine the numbers of P2ry1 wild-type (WT) and mutant mice required. For example, to determine the number of mice (n) and cells (c) to analyze for electrophysiological recordings, a power of 0.8, significance or alpha of 0.05 and effect size or Pearson’s r of 3.6 was used. Thus, for these experiments, data was generated from c = 3 per animal or more, and from n = 3 or more. In this case, each c and each n are biological replicates. Differences between means were assessed by unpaired Student t-tests, in some cases with the Bonferonni correction for multiple comparisons, assuming equal variance, or evaluated using analysis of variance (ANOVA) with Tukey post-hoc tests. As mentioned above, a p value < 0.05 was considered significant. Student t-tests were tested for significance with two tails if the direction of the outcome was not predicted (e.g., initial comparisons of morphology, MHC isoform, synapse elimination, electrophysiology, calcium signals and shortening/fatigue between P2ry1 WT and mutants) and with one tail if an outcome was predicted (e.g., subsequent calcium and shortening/fatigue experiments between P2ry1 WT and mutant after treatment with MRS2500 or high/low potassium). In source data files, all reported statistical tests from text or figure legends are italicized and in red font. Cellular and Molecular Neurobiology 31:909–920. The Journal of Physiology 591:5599–5609. The Journal of Physiology 195:493–503. Annals of Physical and Rehabilitation Medicine 54:88–108. Journal of Applied Physiology 118:662–674. British Journal of Pharmacology 119:253–260. Advances in Experimental Medicine and Biology 949:109–145. The Journal of Physiology 115:320–370. The Journal of General Physiology 138:95–116. Frontiers in Cellular Neuroscience 9:436. Frontiers in Cellular Neuroscience 10:276. The Journal of Physiology 522 Pt 1:165–175. In: B Katirji, H. J Kaminski, R. L Ruff, editors. Neuromuscular Disorders in Clinical Practice. Springer. pp. 3–21. Journal of Applied Physiology 61:1999–2004. The Journal of Physiology 474:193–202. The Journal of Physiology 213:533–544. Pflügers Archiv - European Journal of Physiology 448:452–456. The purinergic neurotransmitter revisited: a single substance or multiple players? Respiratory Physiology & Neurobiology 180:88–96. Acta physiologica Scandinavica. Supplementum 593:1–63. Molecular and Cellular Neuroscience 28:694–702. Advances in Protein Chemistry and Structural Biology 103:263–294. Journal of Clinical Investigation 121:4082–4094. Journal of Molecular Neuroscience : MN 57:446–451. Journal of Applied Physiology 84:1260–1268. Thank you for submitting your article "Activity-induced Ca2+ signaling in perisynaptic Schwann cells is mediated by P2Y1 receptors and regulates muscle fatigue" for consideration by eLife. Your article has been reviewed by three peer reviewers, and the evaluation has been overseen by a Reviewing Editor and Richard Aldrich as the Senior Editor. The following individuals involved in review of your submission have agreed to reveal their identity: Wesley Thompson (Reviewer #1); Markus Schwab (Reviewer #2). Heredia et al. have studied an important topic in glial cell biology, the role of terminal/perisynaptic Schwann cells (TPSCs) at the neuromuscular junction (NMJ) in the control of motor functions. Specifically, the authors investigated a preparation of the diaphragm muscle (which includes the phrenic nerve) from neonatal transgenic mice that express a genetically encoded Ca-sensor TPSCs, and in TPSCs lacking the purinergic P2Y1 receptor. The authors carefully quantify the Ca responses and show the stimulus frequencies that elicit them and the temporal characteristics of the signals. 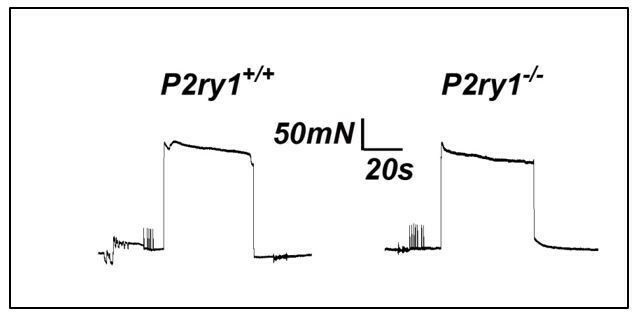 Major conclusion of the paper are (1) nerve activity-induced Ca2+ signaling in neonatal TPSCs is mediated by neuronal adenine nucleotide-mediated stimulation of P2Y1R, which is nevertheless dispensable for normal development and for synapse elimination; and (2) Ca2+ signaling in TPSCs modulates the transduction of muscle action potentials and thereby adds to muscle fatigue. The authors provide evidence that the latter is not synaptic but rather relates to the ability of muscle cells to generate action potentials, possibly reflecting the perisynaptic potassium concentration. This study significantly adds to our knowledge about TPSC functions in motor control and provides a conceptual framework for subsequent studies on the mechanisms of glial Ca-signaling at the NMJ. 1) There is no direct measurement of potassium uptake by TPSCs shown (or the measurement of perisynaptic K+ by K+-sensitive electrodes). The most direct measurement could be the difference between the anticipated membrane potential of the glia – given a change in potassium concentration – and the actual measured membrane potential. There is also no obvious connection between external potassium manipulations and the calcium release inside the glia. Do potassium manipulations produce the glial potassium responses in the absence of nerve stimulation? 2) The calculation of the "rise to peak" or "time to 50% decay" is not appropriate for EPPs or mEPPs because of the cell's capacitance. Can the respective current responses be measured in a voltage-clamp procedure? 3) It is unclear how the TPSCs located at the synapse can affect the fatigue of the entire muscle fiber. If the presumed effect is on the portion of the muscle fiber under the synapse (and perhaps the transmission of action potentials from this region of the fiber to the rest of the fiber) this should be discussed. The authors should also address the question over what length of fiber the altered perisynaptic potassium can be effective in changing action potentials of the entire fiber. - Figure 1A: are the sensory axons of the phrenic nerve recombined in Wnt-Cre mice (i.e. tdtomato+)? What exactly is depicted here (add to legend)? - Figure 2F: add significance. - Figure 3C: add variance and p values. - Figure 4F: lacks quantification. - Figure 6: adding 10 mM [K+]o had markedly different effects in muscle cells from wildtype and P2Y1-deficient mice. Can this be reproduced in wildtype muscle preincubated with MRS 21500? - Figure 3—figure supplements 1 and 2: the quantification of data is missing. 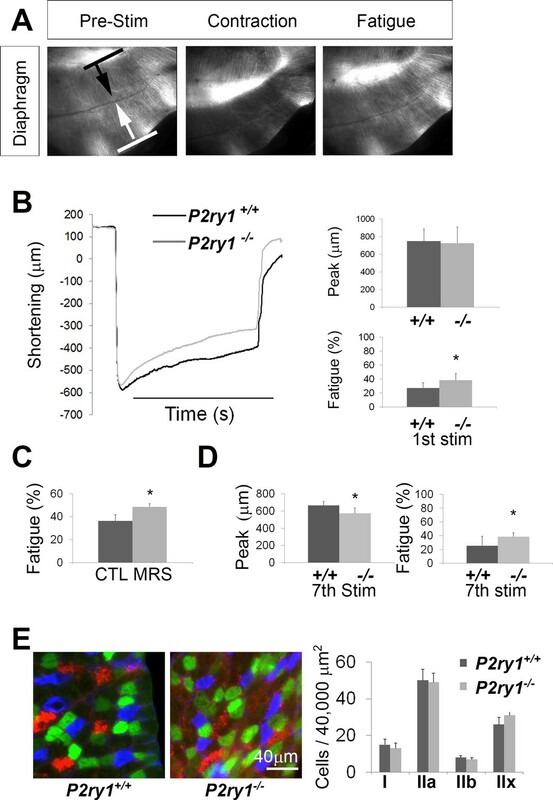 - Figure 6: did the authors also use P2Y1R mutant mice for calcium imaging at P15? It would be more consistent to include P2Y1R KO data in A/B. Preserved calcium signaling at P15 should be shown. Last question first: After treating the preparation with tetrodotoxin, electrical nerve stimulation no longer produced muscle contraction. In these TTX-treated preps, treatment with potassium still produced calcium responses in TPSCs. Therefore, the calcium responses were not likely to be caused indirectly by potassium-mediated nerve activation, followed by nerve-derived, ATP-mediated P2Y1R activation on TPSCs. Additionally, potassium triggered TPSC calcium responses in P2Y1R mutants, in which nerve stimulation itself failed to elicit calcium responses. This result also suggests that the TPSC calcium response to potassium is not indirectly caused by an effect of potassium on the nerve, followed by nerve-derived ATP-mediated P2Y1R activation on TPSCs. Second to last question: We do not know the mechanism by which potassium triggers calcium responses in TPSCs, other than that it is not caused by external calcium, but rather by release from internal stores. We do have new information that potassium depolarizes TPSCs (see directly below). Therefore, TPCSs, similar to neurons (Ryglewski et al., PLoS Biol, 2007 5(4):e66), may possess a membrane voltage sensor that activates metabotropic signaling pathways leading to intracellular calcium release. First question: With the help of Robert Renden, a colleague in the department who specializes in the recording of whole cell potentials and currents in tissue slices, we tested whether TPSCs exhibited a response to external potassium ([K+]o.) by obtaining whole cell voltage recordings of perisynaptic/terminal Schwann cells (TPSCs) from P6-P7 diaphragm muscle derived from Wnt1-GCaMP3 mice. After treatment of the muscle with 10mg/ml collagenase for 30 minutes at 37 0C, TPSCs near the surface were identified by green fluorescent GCaMP3 signal in somatic cytosol, located adjacent to red fluorescent a-BTX-stained endplates (see Author response image 1). Whole cell recording configuration was achieved using 2-mm borosilicate pipettes pulled to 5-7 mΩ tip resistance. Whole cell access was 8-20 mΩ, and leak current was <-50 pA when voltage-clamped at -60 mV command potential. Pipette internal solution contained (in mM): 97.5 K-gluconate, 32.5 KCl, 40 HEPES, 12 Na-phosphocreatine, 2 MgATP, 0.5 GTP, and 0.5 EGTA. Voltage recordings were made using current-clamp mode (I=0) on a HEKA EPC 10 amplifier controlled by Patchmaster software. - Closely predicted change, according to HGK equation, of resting membrane potential in response to changes of [K+]o. These results suggest that two of the three cells recorded from shared characteristics with central perisynaptic glial cells, and contained a potassium-permeable channel, at rest. The identity of the third cell is unknown, but showed nonlinearity in input resistance, a small voltage-dependent spike, and less negative resting membrane potential. We think based on their preliminary nature, together with the fact that this represents the first analysis of whole cell currents of TPSCs that we are aware of, that these data are best included as data not shown. We have included the data as such, but have included a description of the methods in the appropriate sub-section. While we were aware that the EPC is faster than the EPP based on seminal contributions of Takeuchi and Takeuchi (1959), and that EPC kinetics change based on the changing potential during the EPP (Magleby and Stevens, 1972) we were still under the impression that a comparison of EPP/mEPP kinetics between two genotypes not shown/presumed to exhibit different muscle membrane capacitance was valid. The literature appears full of examples of such comparisons (Cantuti-Castelvetri et al; J Neurosci, 2015 35(4):1606-16; Yang et al., Neuroscience, 2007 149(4): 768–778, etc.) including those studying the function of TPSC Ca2+ signaling (Castonguay and Robitaille J Neurosci., 2001 21(6):1911-22). Of particular relevance to our manuscript, Fatt and Katz (J Physiol, 1951 115(3):320-70. ); Beránek and Vyskocil (J Physiol 1968 195(2):493-503) and Kuba and Tomita (J Physiol 1971 213(3): 533–544) as well as others showed a lengthening of the decay of the EPP in response to AChE inhibitors, while many others have demonstrated similar effects examining EPCs. However, we concede that we have not empirically demonstrated that P2ry1 wild-type and mutant muscle membrane capacitance is not different. Our major goal was to determine the amplitude of the EPP in P2ry1 wild-type and mutants at the beginning and end of high-frequency trains. Thus, while an analysis of the kinetics of membrane currents from muscle endplates is possible and would better support the lack of functional AChE involvement at the P2ry1 mutant NMJ than the temporal kinetics of EPPs/mEPPs, we do not feel that such data would sufficiently enhance the main findings of our manuscript.Accordingly, if the reviewers wish, we will remove the rise-to-peak and time-to-decay data of the mEPPs. First item for discussion: This was discussed in the original version of the manuscript. However, we felt that additional experiments could help further shed light as to whether the enhanced fatigue we observed in P2ry1 mutants was mediated by perisynaptic events or by events along the entire muscle fiber. We reasoned that if direct muscle stimulation caused a similarly enhanced muscle fatigue in P2ry1 mutants, then this would fail to support the idea that perisynaptic dysfunction, such as the failure to maintain potassium ionic homeostasis, was responsible for the effects on nerve stimulation-induced fatigue. We performed these experiments in muscle strips at P15, because we were unable to place the field stimulation electrodes at the appropriate positions to reproducibly cause fatigue in whole diaphragms at P7, similar to the setup used to produce fatigue in response to nerve stimulation. Moreover, we had performed nerve stimulation-induced fatigue in diaphragm strips at P15 and found an effect similar to that observed in P7 whole diaphragm (Figure 5—figure supplement 1B). When we performed these experiments, we found that peak force and fatigue were not statistically different between P2ry1 WT and mutant mice (peak force, 283.3+19.3 vs. 277+10.7 mN, P2ry1 WT vs. mutant; p=0.32; ending vs. peak force, 93.2+2.1% vs.89.6+5.8%, P2ry1 WT vs. mutant; p=0.19; n=3; see representative example in Author response image 3). In the revised manuscript, we added 2 sentences describing these experiments and described them as “data not shown.” We also added “the perisynaptic region of” in front of muscle fibers in the following sentence, in order to highlight this conceptual point of the finding. We also added a sentence in the Discussion that utilizes this data to support the idea that the fatigue-enhancing effects of high potassium are more likely to be caused by perisynaptic events rather than events along the entire fiber. Finally, we added a line about direct muscle stimulation in the Materials and methods. Second item for discussion: The direct stimulation experiments argue against the idea that calcium signaling within TPSCs regulates the effects of potassium on muscle APs far outside the perisynaptic region. One way to measure the precise distance away from the endplate that is affected would be to record muscle APs at variable distances from this synaptic region during the latter stages of high-frequency nerve stimulation in P2ry1 WT and mutant diaphragm. Muscle APs recorded in this manuscript were generated from synaptically positioned intracellular electrodes (e.g., in which the rise times of mEPPs were under 0.2 ms). We feel that while such an experiment is valid and would help address the precise distance away from the motor endplate that these effects could be achieved, that it is beyond the scope of this manuscript. Schwann cells along the phrenic nerve trunks and at the diaphragm NMJs are recombined in these mice. We added a sentence in the figure legend to describe this. The sensory afferents innervating muscle spindles (as well as other muscle sensory receptors) are neural crest-derived and thus also exhibit recombination. However, there are only a few spindles per rodent hemi- costal diaphragm (Barstad, Experientia, 1965 21(9):533-4) – the sensory innervation of one in the top left corner of the left panel in Figure 1A can be seen, in red. Done, and ANOVA added to statistical methods. Although we understand the rationale for showing the muscle APs first, since there is a phenotype, we feel that it makes more sense to show the EPPs first, simply because a.) they’ve been examined before b.) presynaptic precedes postsynaptic conceptually, and c.) their similarity between genotypes (4A) is conceptually similar to the similarity in percent AP success (4B-D). Only 4E shows a difference, which is the muscle AP shape. To place 4A after 4B would break up the AP figures (4B-E), and to place 4A after 4B-D would seem to be going backward from post to presynaptic. We’re assuming this was meant to be 5E, as 4E is quantified and there is no 4F or 5F. We’ve added the quantitative data to the figure legend. We found similar effects on muscle fatigue exerted by high potassium in WT muscle treated with MRS2500. In addition, we found similarly reduced calcium responses to potassium in WT muscle treated with MRS2500. We have included this new data in Figure 6 (now called Figure 7) and the legend and mentioned it in the Results section. We’ve added the quantitative data to these 2 supplemental figure legends. We found similarly absent calcium responses at P15 in P2ry1 mutants as in MRS2500-treated P2ry1 WT mice. We added this data to the figure. We also added a graph of these responses and included the quantitative data in the figure legend. This work was supported with funds from the National Institutes of Health (NIH): GM103554 and GM110767 (to TWG); National Center for Research Resources (5P20RR018751-09) and the National Institute of General Medical Sciences (8P20 GM103513-09) to GWH. Animal experimentation: This study was performed in strict accordance with the recommendations in the Guide for the Care and Use of Laboratory Animals of the National Institutes of Health. All of the animals were handled according to approved institutional animal care and use committee (IACUC) protocol (#00-666) of the University of Nevada School of Medicine. The University is fully accredited by AAALAC International. © 2018, Heredia et al.